This photo was taken on July 7, 2018 6:34 AM. The location was in the City Center Section of Washington DC. The "Take It!" came as I again happened upon This building site which I had photographed some months ago and presented on this site. At the time of the aforementioned photo, little did I know that this great big blank wall would capture the imagination of someone else and take on professional billboard attention and status. What I found to be lots of fun was the silhouette shadow of the nearby buildings which were superimposed by the sun's position at the bottom of the now formal ad. Sometimes, nature is just not to be denied. I will keep occasionally checking on this site for future developments and pass them along. Wishing everyone a rediscovery and perhaps your very own viewing of nature having its way. I’d love to see that exhibit. 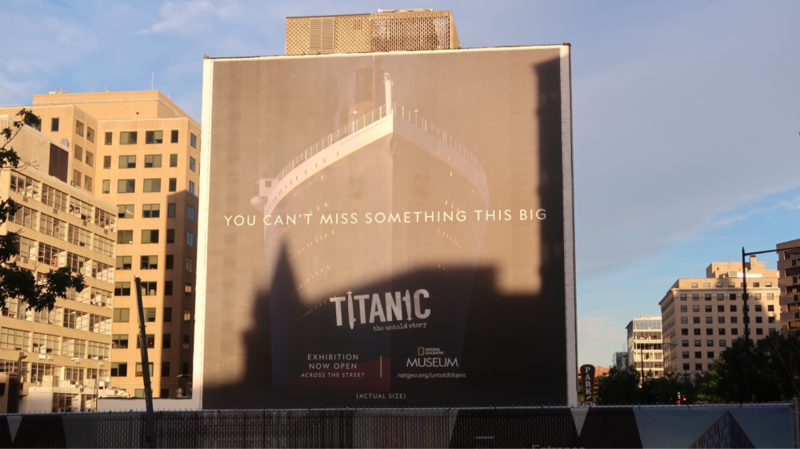 “You can’t miss something this big,” oh the irony. I bet a lot of people’s asked that back then. I’m going to have to dig up the wall photo from before. I don’t think I’ve ever seen a before and after photo like that. They have those all over the place in LA, building billboards.